Following on from the last post, the new gears arrived, and at the weekend I stripped down the Bafang CST Hub motor and replaced the planetary gears. There, that was easy wasn’t it? OK, for my own satisfaction and to document the process, here is a description and a few photos of the process. This describes each of the steps I took while doing the job. Since completing it I have realised there is a shortcut if you are only working on the gears, so make sure you read to the end! Step 1. Remove the wheel from the bike. If you need instructions for this, you should probably stop now. Remove the wheel nuts and torque washers. 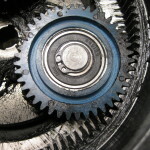 Place the wheel on the chosen support on your workbench drive gear side up. My choice of support while working on the wheel is a car tyre, in this case a 145 by 10″ tyre off a mini. It’s a good size, and holds the wheel securely without damaging spokes or axles. 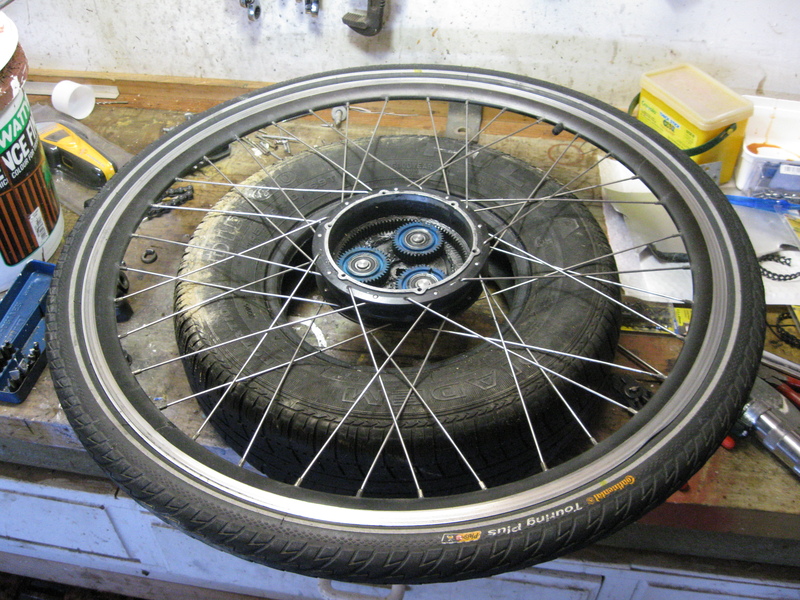 A larger tyre may work, but would take up more bench space. Step 2. 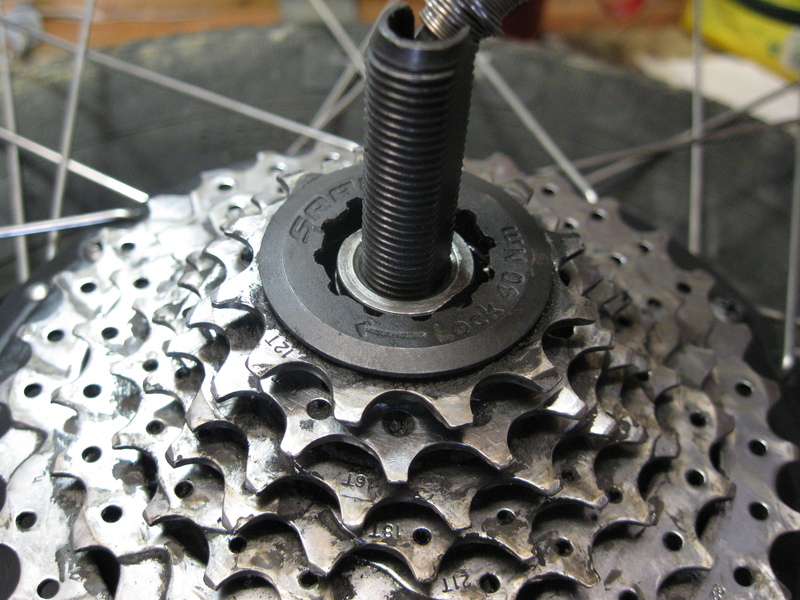 Remove the gear cassette off the hub – not strictly necessary it just made access to the freewheel nuts easier. You will need a cassette removal tool, which is a multi-tooth socket which goes over the axle (and power cable) and engages inside the nut holding the cassette on. I use an adjustable spanner on the hex nut. 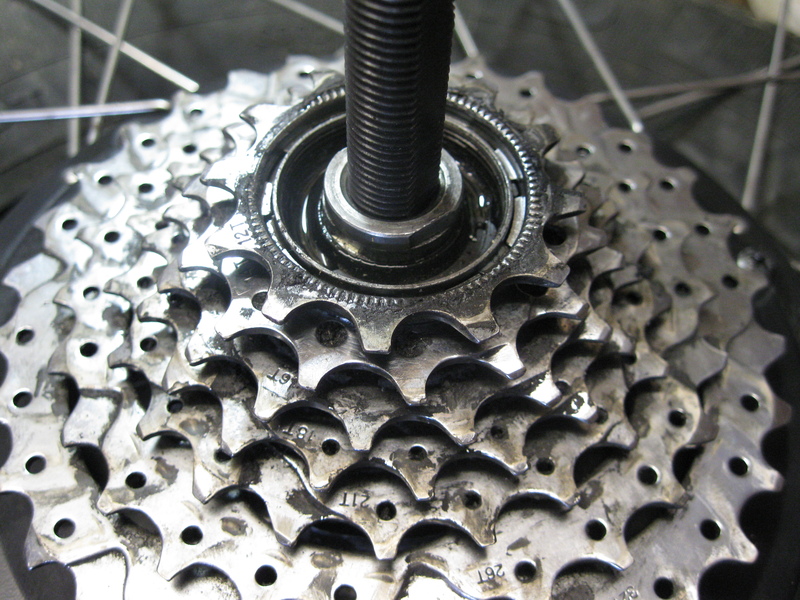 Before removing the nut you will need to hold the gear cassette firm, as the freewheel will let it turn otherwise. 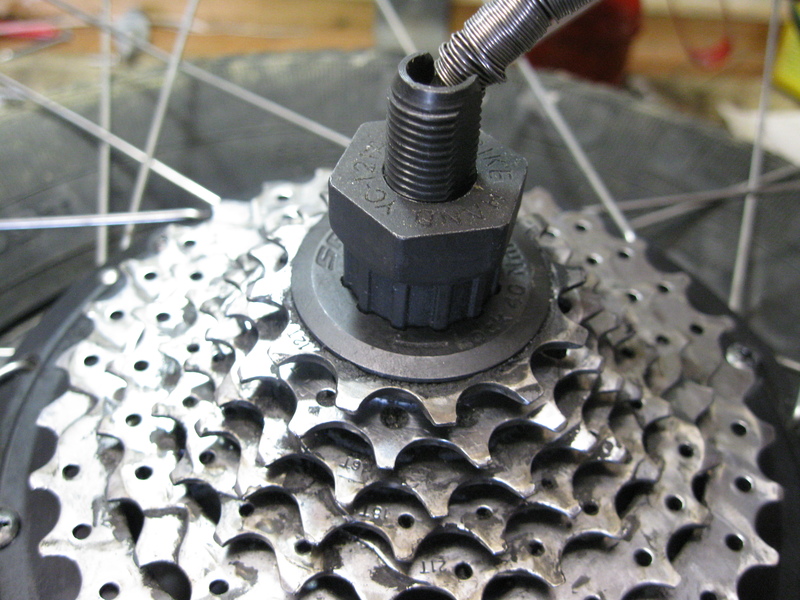 The correct tool to hold the cassette is a chain whip, a piece of bicycle chain attached to a handle, that wraps round the gear set, in the opposite direction to the direction the nut is turned. I use a chain oil filter wrench, which is almost the same. 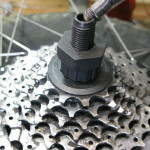 So undo the nut and remove the cassette, taking note of the position of the loose gears at the small end, and any spacers used. 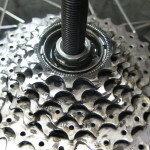 I am using a 7 speed cassette on an 8 speed hub, so have a 4.5mm spacer between the cassette and the hub. Step 3. Remove the free wheel. This is the part the cassette was sitting on. 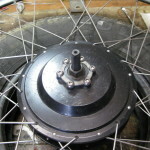 Inside the freewheel there is a lock-nut and a retaining nut. They are quite difficult to get at being inside the freewheel. I think they are 17mm across the flats, but they are not hexagonal, just round with two flats on them. So normal sockets and ring spanners are no use here. 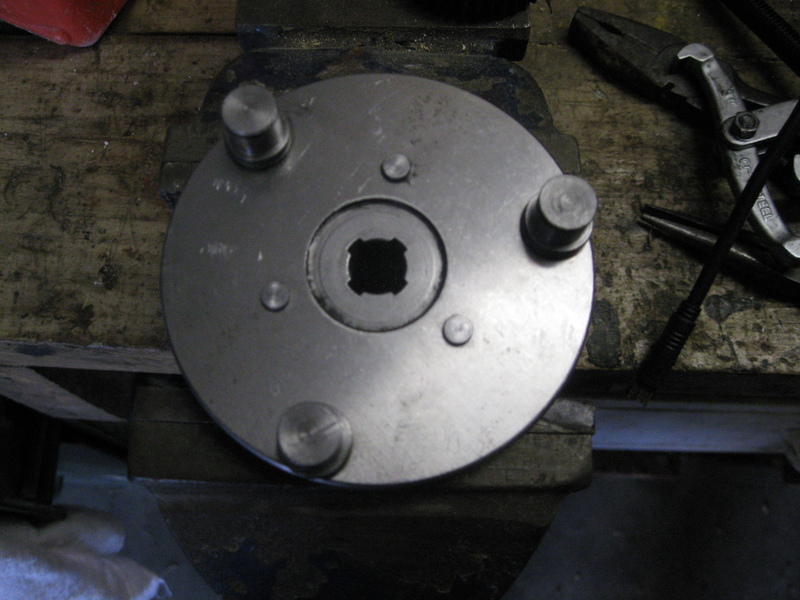 My cone adjuster spanners only go up to 16mm, so in the end I used an adjustable to ease each off. You have to hold the axle still using a 10mm spanner or another adjustable. 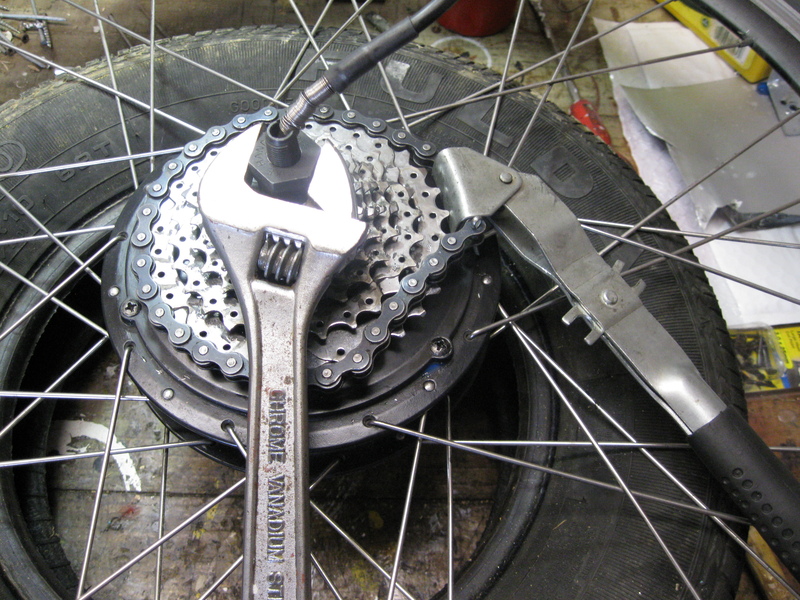 When both nuts are off, carefully lift out the freewheel, taking care not to loose or disturb any of the ratchet parts (the pawls and springs) or the shims and washers that may be present between the nuts and the freewheel or the freewheel and the hub. Step 4. Release the 6 Philips head screws around the OUTSIDE of the hub, you do not need to remove the 6 Philips head screws close to the centre of the hub. The screws around the outside should come out fairly easily, but they are held in with thread locker, so use the correct size screw driver ( a very close fit inside the screws) and put lots of downward pressure on the screwdriver. If there is no movement, try tapping the top of the screwdriver with a wooden mallet while turning the screws. If that fails, localised heat may help with the thread locker, but I would not try that myself. Step 5. Remove the end plate. 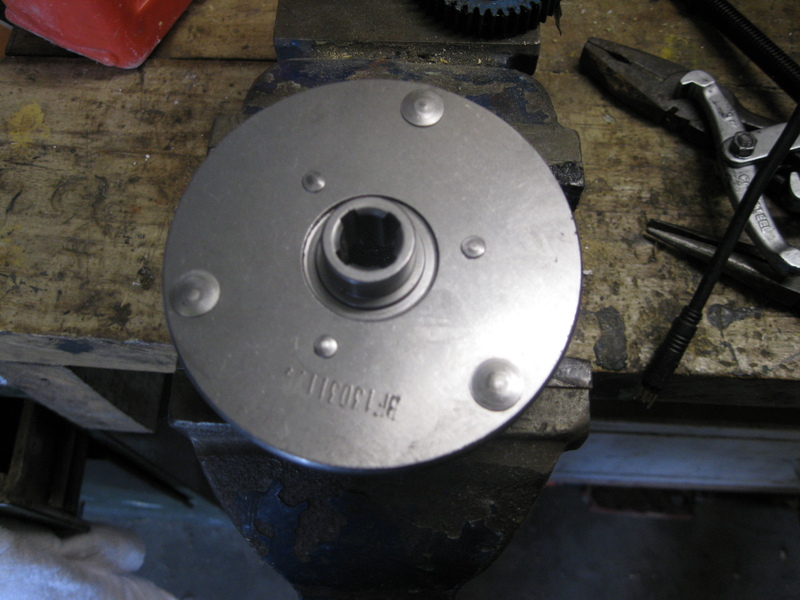 This is quite a task, as there is an interference fit between the end plate and the bearing on the axle shaft. So I used a sharp knife blade to get the first movement away from the seat, and then used blades on opposite sides, moving them around the perimeter, to gently ease the plate away from the hub, and eventually lift it away from the axle. OK, now all you can see is the motor windings, and without any guide it gets quite scary at this point! Obviously the gears are behind the motor, but how do we get the motor out without destroying anything. Well this is where the rather excellent design of the Bafang CST motor comes into its own! Step 6. 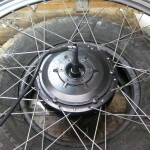 Turn the wheel over, so that the side you have just been working on is downwards (listen for any washers and spacers falling off at this point, and retrieve them asap!). 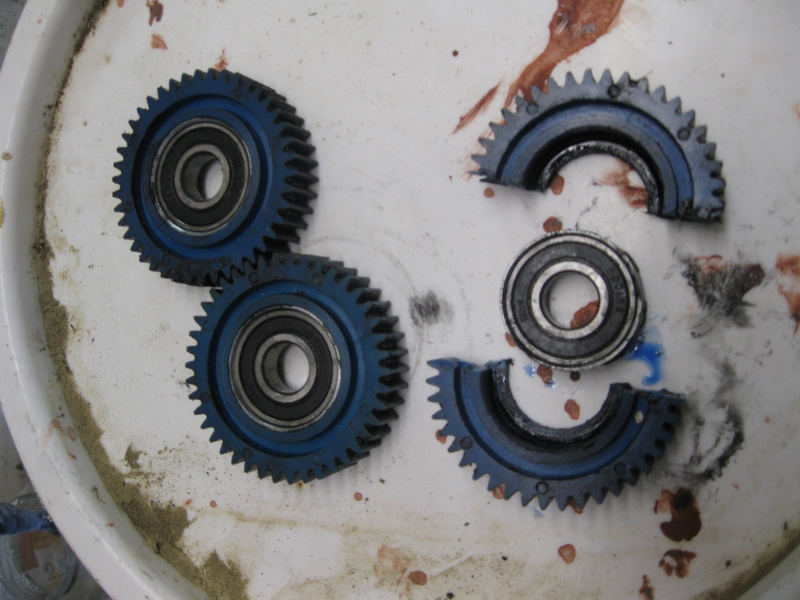 Remove the large nut on the axle, and the two washers (plastic and thin steel) behind it. 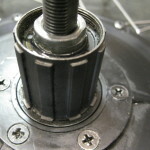 Be careful, because at this point the whole motor can be removed from the other side, and it may fall through. Step 7. Turn the wheel back over, and lift out the motor and axle as a single unit, taking note of the bushes, washers and shims and their order on the axle. 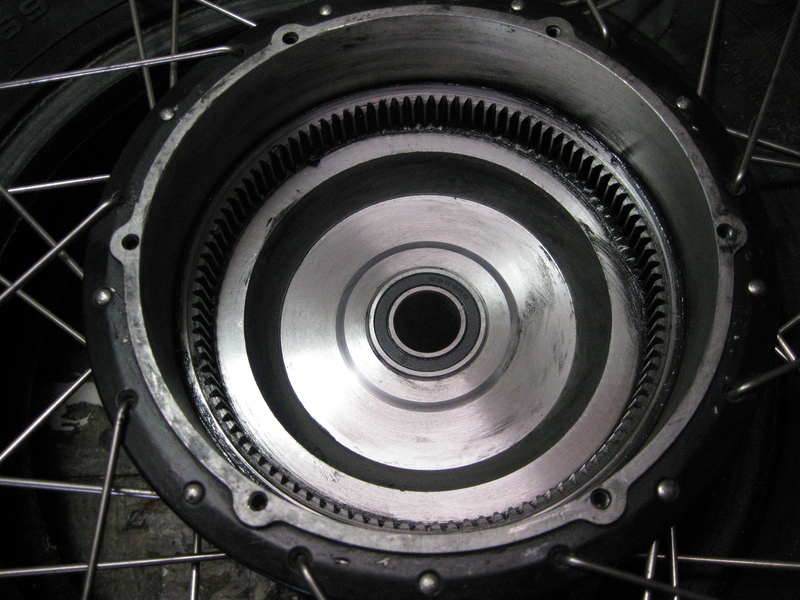 The whole motor, stator and rotor are a single unit and for this job do not need to be meddled with at all, so carefully put it to one side. Now we can see the planetary gears. 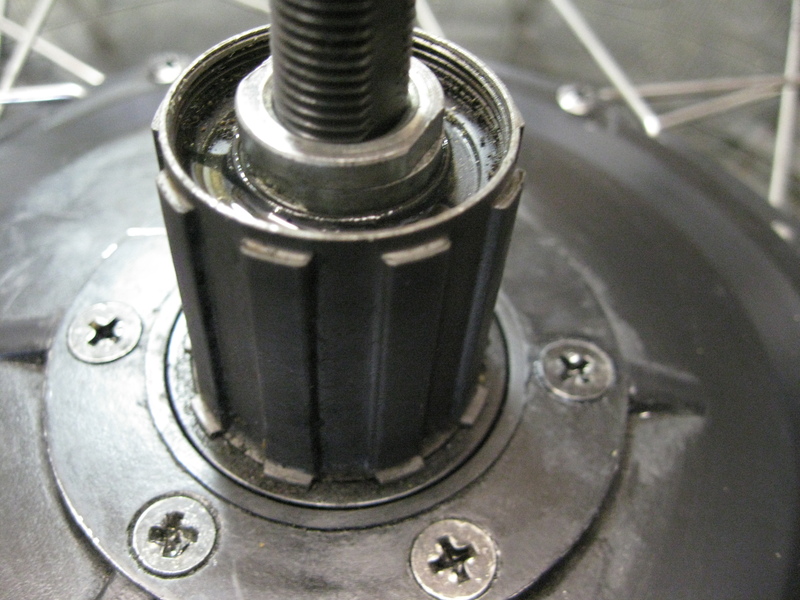 If you look at the motor just removed you will see the sun gear on the rotor shaft, which spins on the axle. Around the outside of the hub you will see the ring gear which is used to drive the wheel. Both of theses are metal and are probably not damaged in any way. 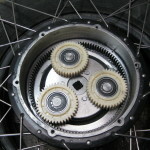 And the most obvious things, and the subject of this work, are the three planetary gears running inside the ring gear, held in place on the planetary gear carrier. This carrier revolves quite happily at the moment, and when it does you can see the planetary gears revolving as they revolve around the ring gear. However, when re-assembled, the planetary carrier engages onto the axle (you can see the 4 splines on the axle and in the carrier) which will make the planetary carrier stationary while the motor is operating. 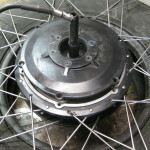 This carrier also includes a clutch between the motor and the wheel, which works with the freewheel to allow for combinations of power, pedaling and freewheeling as required. So when the sun gear in the centre is turned by the motor, it is engaged with the planetary gears, which rotate on the carrier and turn the ring gear on the outside. 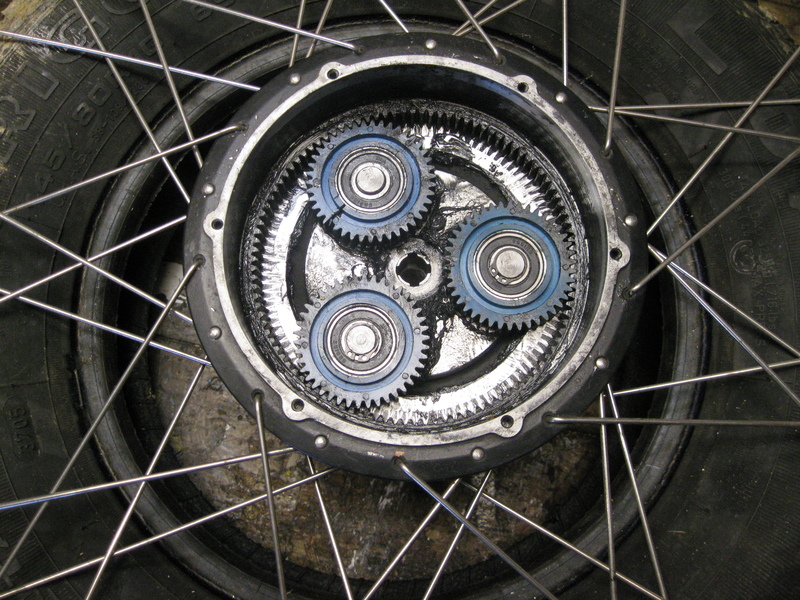 The difference in size between the sun and the ring gears gives the 5:1 reduction ratio in the hub gears. In my case, when I turned the gears, the unusual noise I was hearing when the motor was going could be felt as the gears rotated as a resistance at each turn of the planetary gears. 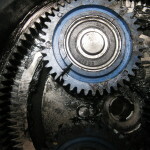 A rudimentary inspection of the gears showed that one of the three nylon gears had split, causing a gap between two teeth, which was being forced closed with each revolution. So the gears needed replacing. Step 8. 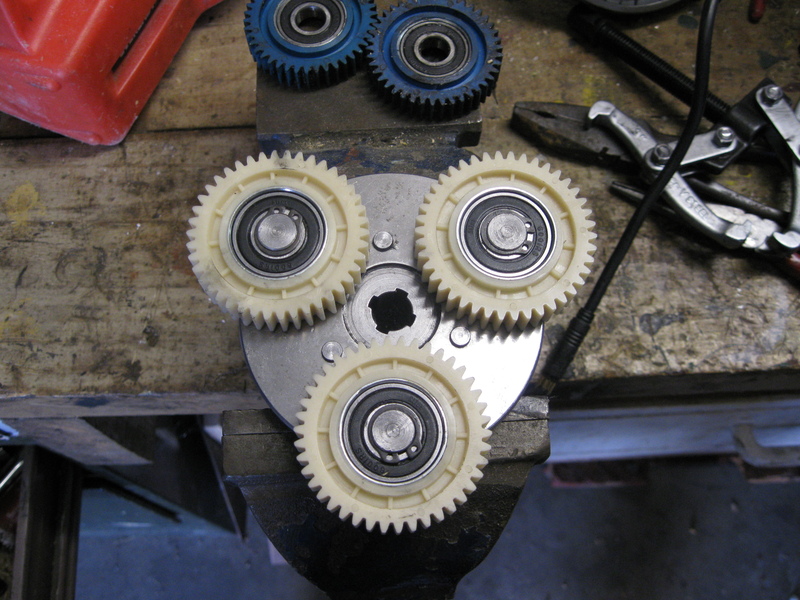 Remove the circlips holding the planetary gears to the carrier, using a decent set of circlip pliers and a little bit of patience. You can leave this step until after Step 9 if you find it easier. At this point I expected the gears to lift off the carrier, but all three were an interference fit on the shafts of the carrier, and my gear remover would not get into the close confines of the hub. Step 9. Turn the wheel over again, and using a suitable size drift (I used a 13 or 14mm 1/2 ” drive socket) carefully tap the planetary carrier out of its bearings. Remove it from the hub. Step 10. Remove the gears from the carrier. If you have a suitable gear remover, use it, but I carefully gripped the gears in a vice, and using another suitably sized drift, gently tap the carrier shaft out of the gear. Take note of which way up the gear is. The deeper side goes towards the carrier. Step 11. 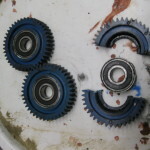 Reassemble with the new gears, using a suitable grease to lubricate the planetary gears, ring gear and sun gear as you do. I use the grease I get with CV joint repair kits (as used on Minis) which is an excellent grease and appears to be the same as that being used originally. During reassembly, check for ease of movement as each part goes together. To my surprise I was still getting a “bump” each time the planetary gears revolved. The gears were perfect, so I looked at the ring gear to see if it had sustained any damage, but it looked fine, all teeth present and perfectly correct. So I isolated exactly the three points on the gear where the bump occurred, and checked between the teeth, and found what felt like a lump of nylon squashed very thinly between two teeth. It took a bit of easing out, which made me think it had been there a while, possibly since the hub was originally built. 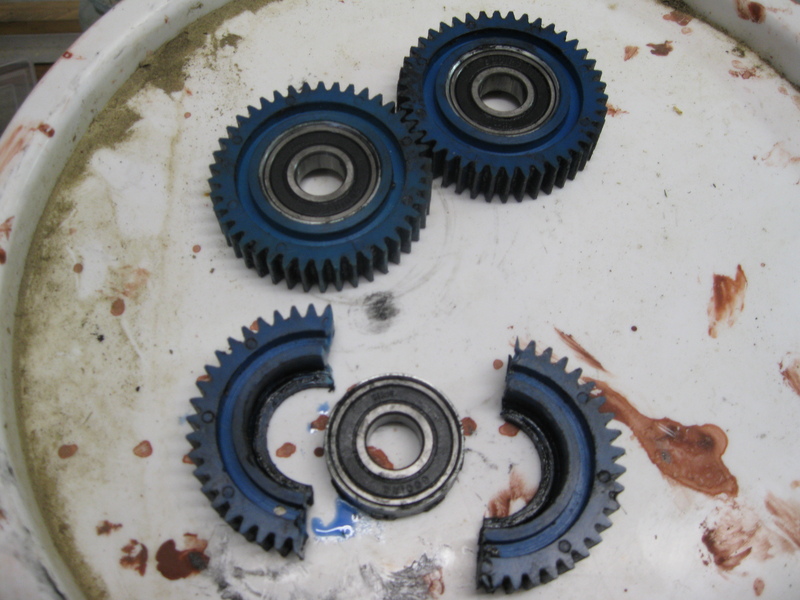 Anyway, when removed, the planetary gears revolved as smooth as the proverbial! Step 12. Continue with assemble, just reversing the process described above. No special tools are required to replace the motor. 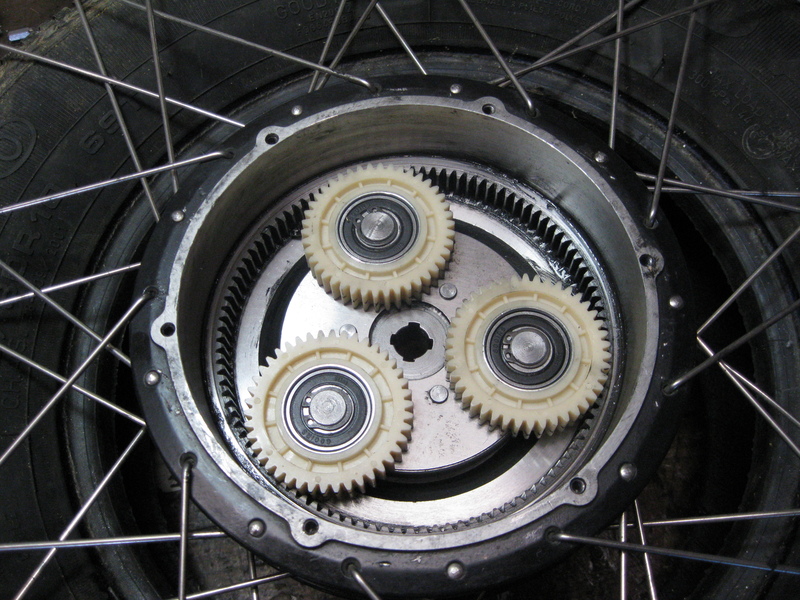 Because it is a single unit, it and the axle just slide into place, making sure the planetary gear carrier is aligned with the axle, and the sun gear is slotted carefully into the centre of the planetary gears. Use a drop of thread locker on each of the 6 Philips head screws just to make sure. 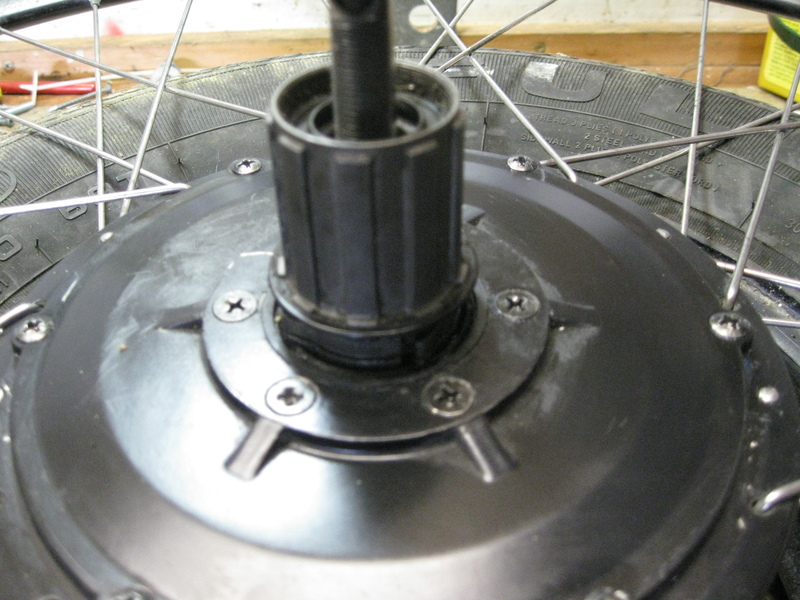 The nuts holding the freewheel on don’t appear to need any float or anything, but I don’t tighten them up too much. 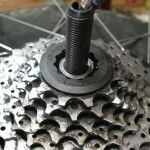 The cassette nut can be tightened without the chain whip, as the freewheel now works in your favour. After I put the whole thing back together again, I realised that I had made a bit of work for my self, Because the motor and drive side and axle are all removed to get to the gears, there is no need to separate any of these components, i.e the cassette and freewheel can be left in place. So miss out steps 2 and 3, start with step 4 and remove the 6 Philips head screws. 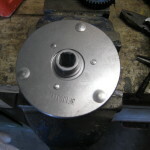 Then proceed to step 6, and remove the large nut at the other end of the axle. 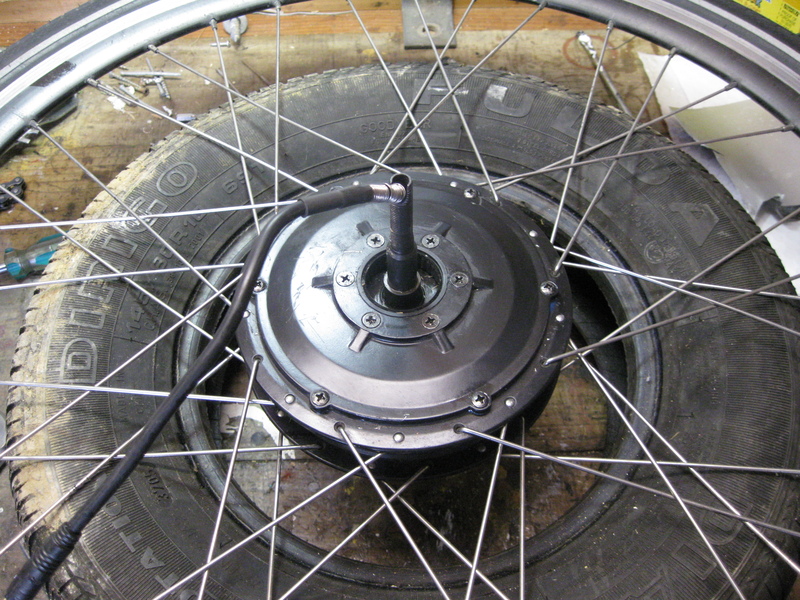 Step 7 is a little different, at this point the axle, motor, freewheel and cassette should lift of as a complete unit. 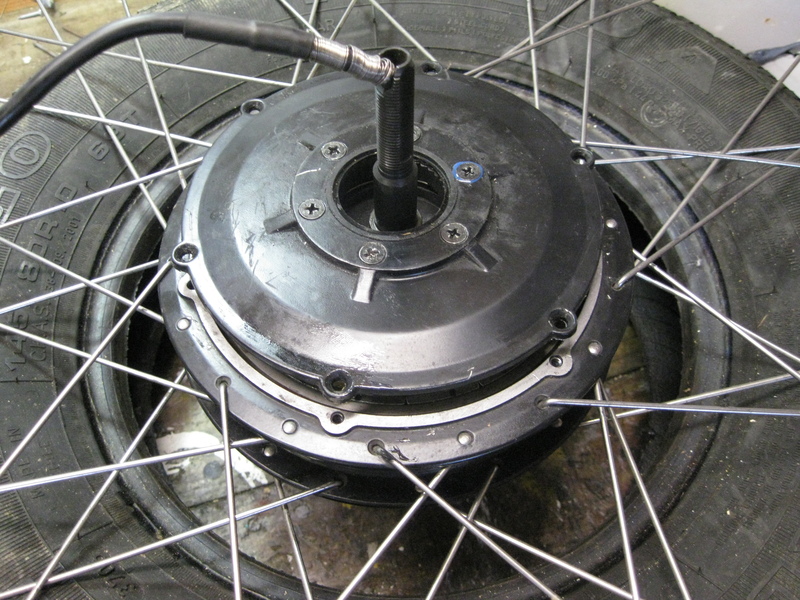 As the freewheel plate is not being separated from the bearing on the axle, the axle, motor, end plate, freewheel and cassette should just lift out without any levering. 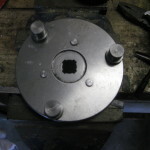 The end plate etc will remain on the axle, protecting the motor windings from damage etc. 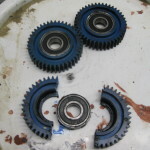 Continue from Step 8 to replace the gears. There isn’t much on the web about these motors, is that a good sign that they don’t often go wrong? 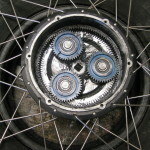 After 5,300 kilometers, other than the split gear mentioned above, the plastic gears were perfect, no visible wear, perfectly square edges on all the teeth. The metal sun and ring gears were also perfect. 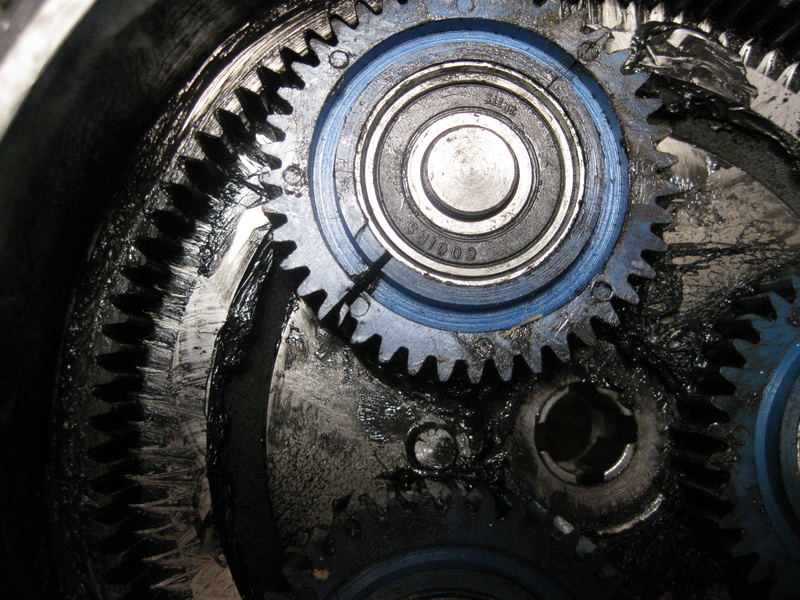 Interestingly, the split gear appears to have broken across a join between two halves of the gear. There is no sign of a seam between two halves on either of the unbroken gears or the new gears, so I am not sure what I am seeing. The foreign object in the teeth of the ring gear may be from the broken gear, but as it was white and the gear is blue, I am not sure. 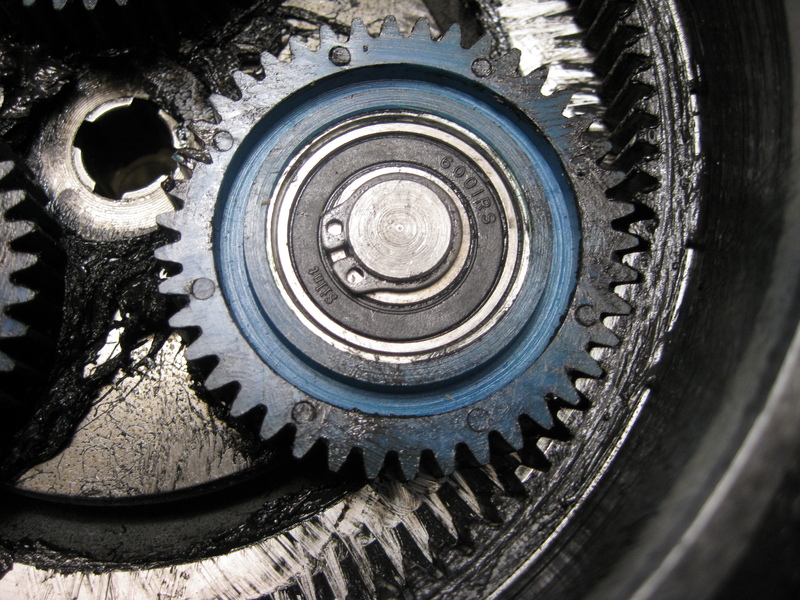 If it was there when the motor was built, it could explain the damage to the gear. I bought three gears from Green Bike Kit, some further research found that I could also have bought all three gears attached to the planetary gear carrier/clutch unit for just US$25. 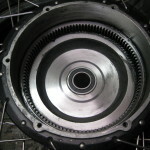 The advantage of this is the replacement of the clutch unit for just a few dollars more, with the added bonus of not having to remove and replace the circlips holding the gears on. Maybe next time! If you are buying parts for the CST motor, I understand that internally it is the same as the BPM motor, so select the BPM parts when ordering. Certainly the 42 tooth gears are the same, I have to assume the rest is. I rode the bike to work this morning, and it sounds good, a lot better than it did the last time I rode it. I noticed that the rim is starting to wear thin where the break pads rub, so I may need a new rim. I also fancy disc brakes, but that would mean a new frame too! 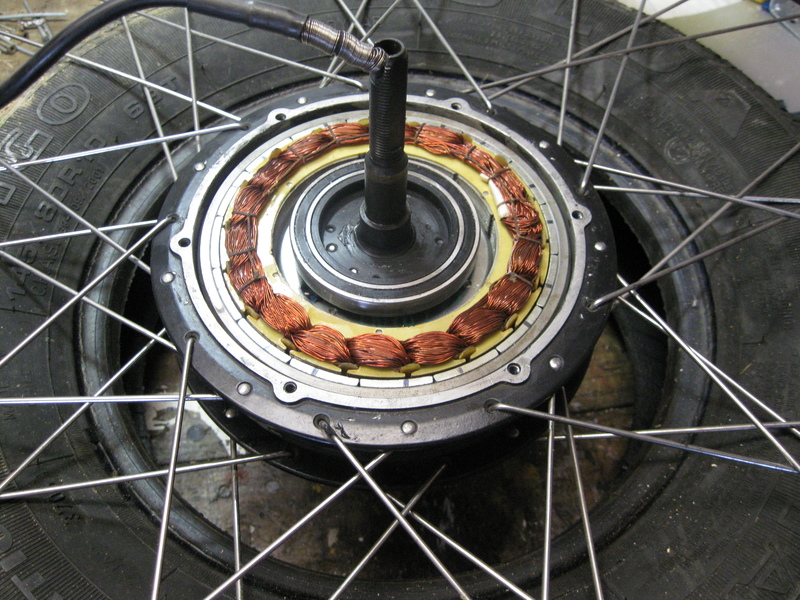 Thanks Chris, both our hub motors are going well touch wood, hopefully I have replaced all the suspect gears by now! Well written piece on renewing the gears. I did the same 6 months ago. My clutch, the same 4 notch version, was gritty feeling in action. I think water had got in at some time.I soaked it in sythetic engine oil for a couple of days and worked it in by turning the shaft.At the time of reassembly I used some Synthetic red grease as I had heard that oil based grease can soften nylon gear wheels.All went well for 6 months, when I started to get an odd ‘crack’ sometimes when putting on power, other times on slowing to a stop.I convinced myself that the hub clutch may be sticking or a gear tooth was cracked or worn.Had hub off within the hour expecting mayhem, but no. All was fine and clean looking. The clutch working like butter.So everything back together. I was pleased the clutch was good because I have discovered the only supplier I know of a new one ‘Greenbikekit’ can only supply the newer 1 notch clutch.The older 4 notch model, with either 3mm or 10mm shafts on the ‘bottom’ side are no longer in production! So the life of my 4 and a half year motor is as long as it’s clutch works.So love and cherish it folks! Sorry I have never had to do that. I am sure there are videos on line about it or something similar, but most people probably use the existing wires as pigtails and attach new wiring to them. Hi, very good work, thank you ! Very helpful for me…. but, I have to replace cable, how can I have access to the endpoint of the cable on motor ? I know its a old subject, but I take a chance ! If answer, thanks in advance ! 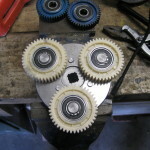 You mentioned that the internal gears provide a 5:1 ratio for the motor. Would it be reasonable to replace these gears with different sizes to change that ratio? I have a 500W hub motor that I would like to modify so that it performs best at lower speeds and I am wondering how radical that idea is. 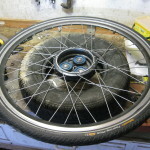 Is it a cassette type hub, or a threaded freewheel hub? I looked up your hub online, and it looks a bit different to my hub. 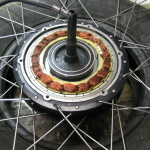 The important nuts are down inside the freewheel. 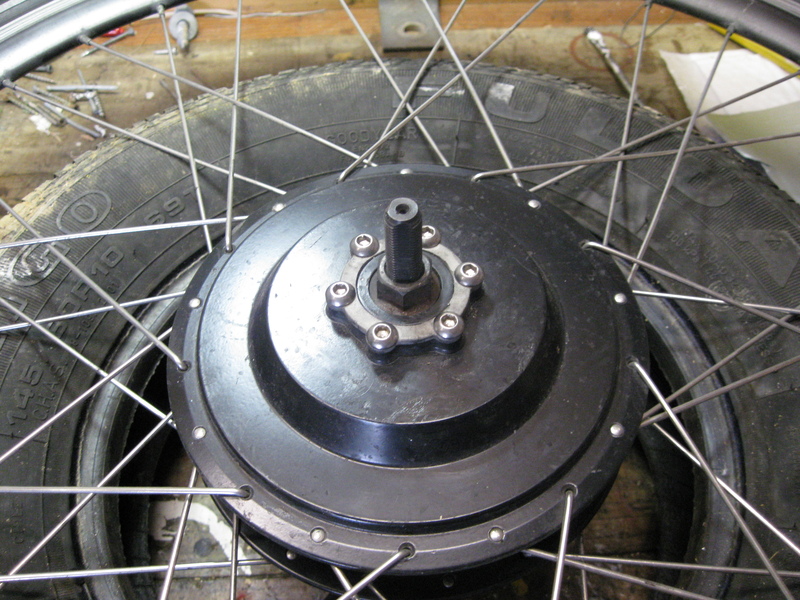 I notice there appears to be a couple of screws either side of the freewheel – is there a retaining ring perhaps? 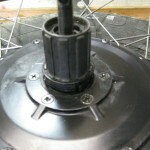 Other than that, search the web again to see if anyone else has removed one of these on this type of hub. I have a RM GO60.750 bafang fat bike hub motor and had it stripped down to the free hub but could not seem to remove the free hub . 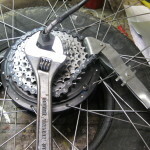 Could you give me any pointers on the removal, you say When both nuts are off, carefully lift out the freewheel, taking care not to loose or disturb any of the ratchet parts (the pawls and springs) or the shims and washers that may be present between the nuts and the freewheel or the freewheel and the hub. I could not seem to remove it and did not want to damage the motor.